The Atocha tragically ended her voyage on a reef off the Florida Keys on September 6, 1622, taking with her 264 souls many of whom, were of royal blood. She scattered over 47 troy tons of treasure over 50 miles of ocean bottom. There were only 5 people to survive the wreck. Ironically Mel Fisher was born almost 300 years to the day that the Atocha went down. His obsession for the Atocha treasure has lasted over 20 years. During this time, Mel found himself selling off other treasures that he had found, trying all the time to get people to invest in his dream... the Atocha. Fighting off bill collectors, power and utilities cut-offs. He could not even pay his own divers at times. Mel was forever going to court to keep other salvage companies away from the wreck areas. The biggest tragedy was the death of Mel's son Dirk, Dirk's wife and another crew member. This happened when his salvage boat "The Northwind" sank over the wreck site on July 20, 1975. Mel Fisher continued on his search despite all the financial problems, death of family and friends. He ended up finding the mother lode. 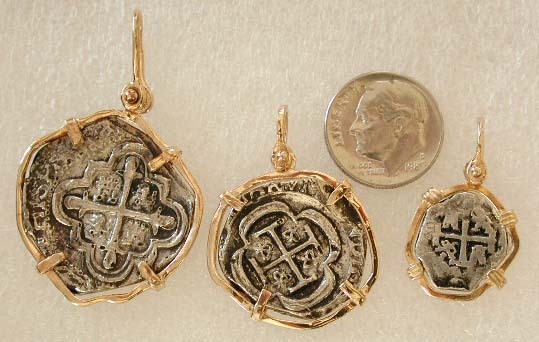 Small - silver Escudos from Charles III around 1680's a pair make wonderful earrings! 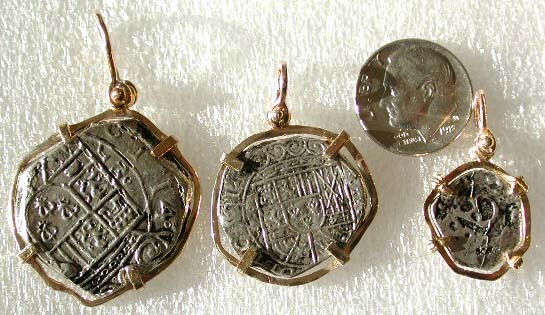 Authentic pieces of eight, Reales and other coins from the Atocha with documentation cost anywhere from $1,000 to $10,000 depending on the quality and gold content.